A framework for inbound marketing agencies to upsell additional marketing services to clients using the data they already have. For data-driven and ROI-focused agencies and marketing consultants, selling additional work to existing clients is the easiest way to increase revenue, rather than hunting for net-new business. If you’re any good at driving traffic, leads and sales, you’ve had clients where the opportunity to increase budget naturally arises. They like the results and want more, better, faster. When the client asks, “How can we spend more to go faster?” you know what to do. Likewise, you’ve probably also had clients – that no matter how much pitching you do – who will not spend another dime. They see agency services as an expense to be contained or worse, minimized. They just don’t trust that increasing spend will increase results. But, most clients don’t live in either of these extremes. They’re not asking to spend more money and they’re not allergic to it either. For these clients, the big question is: when and how should you apply your knowledge of what’s possible to justify investments in additional services? How: Use data to identify areas of improvement. I divide marketing agency activity into two buckets: business process consulting and marketing services. Most agencies are seen as “marketing service providers”, but the most profitable ones are seen as partners in driving revenue growth for their clients as business process consultants. These activities build trust and establish your agency/account leader as a strategic partner and advisor. These activities are replaceable. Competition among service providers is constantly increasing. Whatever you do, don’t let your firm be seen as a commoditized service provider who can easily be replaced. Instead, get paid for your expertise like any good plumber does: Let’s say you pay a plumber $100 to repair your sink and they tap the pipe once to fix it. You’ve paid $1 for the tap and $99 for them to know where to tap. I am probably NOT telling you anything you don’t already know. But I am surprised at how many agencies and entrepreneurs talk the consulting talk, but when it comes to what they sell, it’s commodities on a price grid – they walk the services walk. Not sure where you fall on the expert versus commodity spectrum? Do this 2 minute self-assessment: Go look at your latest client proposal. Now scroll to the end where you have a cost associated with different activities and deliverables. Then, ask yourself: If your client were to look at what they are paying for, would they put you into the value bucket, or the commodity bucket? use analysis of data to justify the upsell. People tend to trust things that are objective. Data is objective. I trust gravity because I can observe it. People also trust things that meet their expectations, since they can rely on them. Setting expectations that are borne out in the data is a great way to build a foundation of trust. Once you establish a pattern of delivering data, your interpretation of the data will also be trusted. The client learns to trust you because your Business Process Consulting is based on data. Upselling requires you to interpret and analyze data, then make recommendations based on your conclusions. But, marketers often get confused about the difference between reporting and analysis. 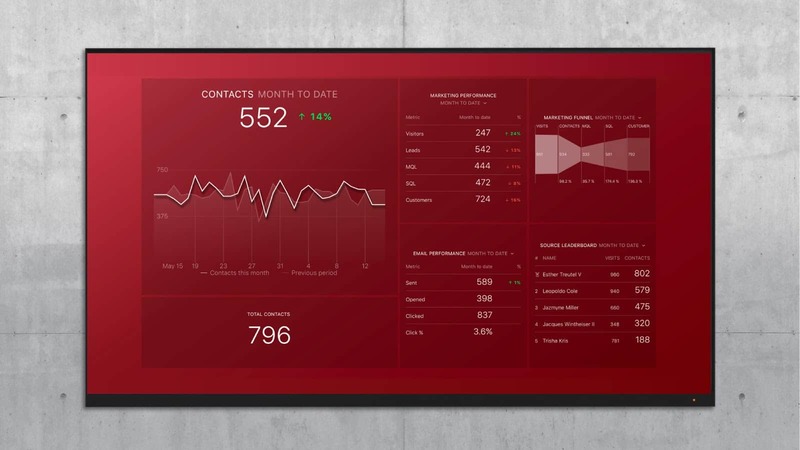 Reporting simply means extracting the data and presenting it in a format that can be easily understood, whether that’s a PDF document, email, or a live-dashboard of data like Databox provides. Reporting can and should be automated, as Databox users know very well. Analysis is a step beyond reporting. What has worked well to drive a client’s desired outcomes and what hasn’t? What should we do next to maximize the ROI of time and budget spent? How can we improve results from campaigns and marketing assets? What is broken that is preventing us from being more successful? The answers will lead you to changes in your scope of work and perhaps new services that justify a higher retainer. If you’re a digital marketer, you’re probably swimming in data. And there’s no shortage of ways you can improve results. In my experience, most clients have little interest in following the daily or weekly changes you make to their campaigns and creative assets. And with many clients, you won’t have enough valuable data to make large upsell-worthy recommendations. I recommend a quarterly cadence to making larger recommendations. The process I use with clients ALWAYS involves a plan before implementation, and analysis only after enough data has been gathered to be statistically significant. Quarterly recommendations fit well with this model. 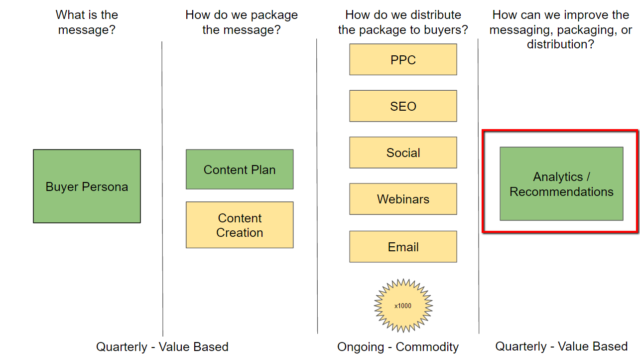 How do we package the message? How do we distribute the package to buyers? How can we improve the messaging, packaging or distribution. Step #4 is the all-important analysis piece, which happens at least quarterly. Some larger agencies who usually serve larger companies do this on a monthly basis. It’s not a bad idea to pitch new ideas on a monthly basis if they don’t require a larger budget. You can save big, budget-changing things for quarterly consideration. When you show clients you’re using data to make recommendations, they get used to the idea that you’re bringing your expertise to the table and have more ways you can add value. I remember the first time a client told me to simplify my recommendations. She wanted my 25 slide presentation to be cut down to just 3 slides! She needed to show her executive team the high-priority challenges and opportunities and gain buy-in for change. I learned a lot from that client. Where are leads getting STUCK in our process? What channels produce the BEST QUALITY LEADS? How ENGAGED are the leads? What channels produce the MOST ENGAGED LEADS? If you can’t tell yet, I’m a big believer in processes. I’ve built my business helping agencies and marketers define repeatable processes. I’m also a big believer that agencies should develop their own processes as intellectual property. But, sometimes, it doesn’t make sense to re-invent the wheel. Below, I’m sharing my process and I’d welcome you to either use it or base yours off of it. The key to my process is my Lead Quality report. It helps companies visualize their funnel and identify areas of improvement. Here’s a schematic showing it. The image above was taken from a live analytics presentation I did for a private coaching group (link is provided at the end of this blog post). On the left, I define what each lead “stage” means. 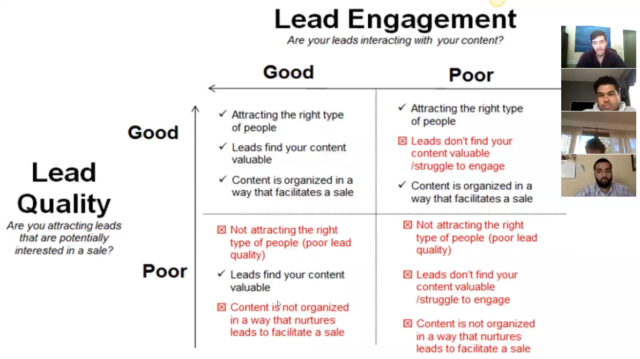 On the right I show where the majority of leads are getting stuck in the marketing process. My analysis of this data for this client led me to conclude that not many leads are engaging with their product-based content. Instead, they get stuck reading educational blog articles and do not show further interest. As a result lead “quality” is poor, assuming you look at quality as a function of revenue value. Buyer Persona Interviews: We seem to be attracting visitors to our content who are the wrong people, or attracting the right people for the wrong reasons. Advanced Lead Nurturing: We are having trouble moving leads from one stage to the next. Email nurturing will help us introduce our products and services as a solution to their challenges, address common pushbacks and ultimately drive leads to a conversation with the sales team. Product Specific Offers: Leads are not engaging with product/service information. Perhaps our product or service content is not engaging? We should try video – or re-think how we talk about the benefits. Sales and Marketing Alignment: Only 10 sales opportunities were generated from the 240 sales qualified leads! Is the sales team even following up with the qualified leads? If you count up those recommendations, you’ll see it is only 230 words + 1 visual, but communicates the value of four potential new projects. That’s not bad for page 1 of a quarterly recommendations report. You could also visualize this same data inside Databox using one of their pre-built templates. Here’s one that uses HubSpot Marketing data to visualize something similar to my Lead Quality Report. 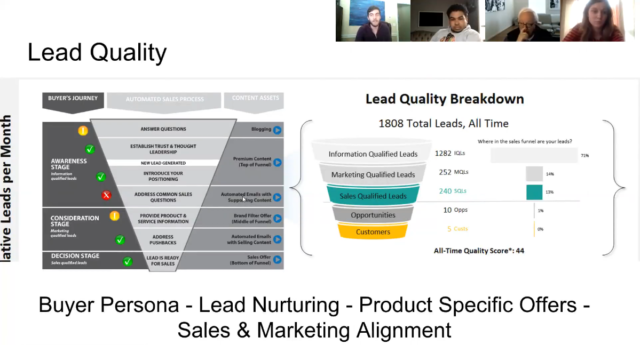 Here’s a zoomed-in screen grab of a funnel showing the number of people who go from visitor to lead to marketing qualified lead to sales qualified lead to opportunity to customer. 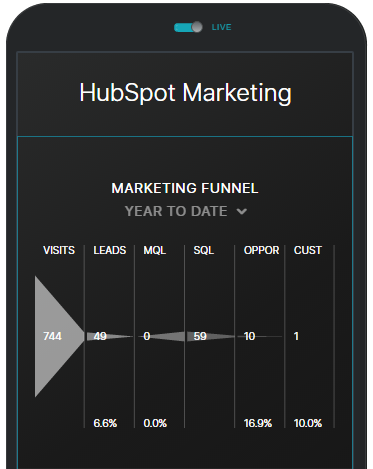 Databox’s funnel visualization also automatically calculations conversion rates, which are shown at the bottom of the image below. 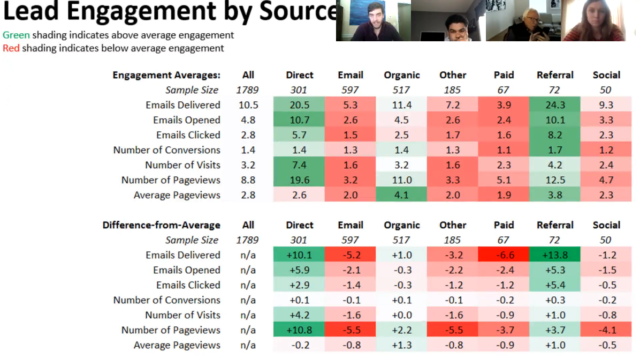 I always recommend looking at lead engagement by marketing channel or traffic source as a second analysis. Below is a snapshot of some example data and my analysis. … are more engaged than leads coming from email campaigns, paid search or social media. Email campaigns with video: Video has been proven to increase click-through rates on email content, page rank in Google and on-page engagement. Paid media management: Maybe we can improve the alignment between this company’s ads and content to improve lead quality from the paid channel. Social media management: Not all social channels are created equal. Let’s do some research and planning to make sure we are spending time in the right networks, with the right messaging. You could also use Google Analytics to do this assuming you’ve setup conversion/goal tracking to capture when you generate a lead. Visualizing your data and your recommendations are critical. Visualization helps generate buy-in. When a client stakeholder asks what they’re paying you for, it’s much easier to draw a circle on a visual representation of a funnel than to try to verbally explain how the campaign is having trouble converting a sales qualified lead to an opportunity. The thought alone makes me shudder. There are multiple ways to grow an agency. But, once you’ve established yourself, the most impactful levers for agency growth are retention and upselling. In fact, I know many 10+ person firms who strive to acquire just 2-3 clients per year and put most of their energy towards servicing and upselling their existing clients. and use a repeatable process for doing it all. Want some 1:1 help implementing these processes in your agency? Request some time. Max Traylor Inbound 2013 speaker and author of the “Content Marketer’s Blueprint”. Max brings a unique brand of knowledge sharing to the inbound marketing industry. 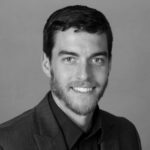 As a trainer-to-the-trainers for Value Added Resellers working with Hubspot, Max is known for his innovative additions to inbound marketing, marketing and sales alignment and employee motivation. Now rockin’ on his own, Max is excited to work with old and new friends – demystifying the marketing and sales universe. And getting the results you’d always known were possible, but never thought you’d get.